Amazing, super creative Angie Richmond has issued a challenge that I love! Check it out, and link up your own list today. This was a fun way to really think about things I want to accomplish. 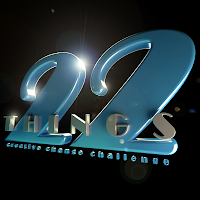 22 Things is a Creative Change Challenge. By signing up, you are announcing to the world - and more importantly yourself - that you are breaking free of the long standing idea that in order to make changes in your life, you have to do BIG things. 22 Things is about making a list twenty-two small steps you can take - right now - to change your life. 1. Develop a regular writing schedule. 2. Go to the beach more. 3. Allow myself to make mistakes. 5. Join a Pilates class. 6. Ride my bike instead of driving. 7. Read more indie authors. 8. Finish my three quilts in progress. 9. Get a plant and keep it alive. 10. Spend more time without my phone. 11. Make more lists; they work. 12. Finish the outline for my new WIP. 13. Edit my NaNo novel. 16. Write in my journal. 17. Spend more time with friends. 18. Take a dance class. 19. Stop and watch the sunset. 21. Do a 10K run. 22. Indulge in chocolate occasionally. Love the list, especially the chocolate and the technology free day, good idea! And the hugs, gotta love more hugs! Why thank you :D I can never get enough hugs or chocolate!! I don't know what #wordmonger means, but I like the sound of it. My favorites are 4, 9 and 13. I look forward to watching your progress. I even forget to remove old cut flowers from the vase in the living room! My daughter's recently taken charge of flowers and plants in the house...so more may survive, and cut flowers will be replaced more frequently! It was a running joke that dead, wilted, papery brown flowers adorned our lounge more than live ones! By the way, I've tagged you in the Lucky 7 meme!